The two Twelver Shi'i villages of al-Fu'a and Kafariya have come to the forefront of media attention in light of the stipulation of evacuations of rebels and civilians from the recently reconquered east Aleppo towards Idlib in return for evacuations from these two villages. Since the rebel conquests led by Jaysh al-Fatah in spring 2015 that saw the regime lose its remaining control of all major towns in Idlib province including Idlib city itself, al-Fu'a and Kafariya have remained as isolated regime outposts under siege. Naturally, given the religious affiliation of the people of these villages, their siege is a matter of strong concern to Iran and the native and foreign Shi'i militias operating in Syria. For example, in September 2016, Akram al-Ka'abi of Harakat al-Nujaba'- aligned with Iran and one of the most important Iraqi Shi'i factions intervening in Syria – claimed the start of a new operation to break the sieges of al-Fu'a and Kafariya, though it should be noted that al-Ka'abi frequently engages in outlandish rhetoric and did not make clear how exactly such an operation was to be carried out. 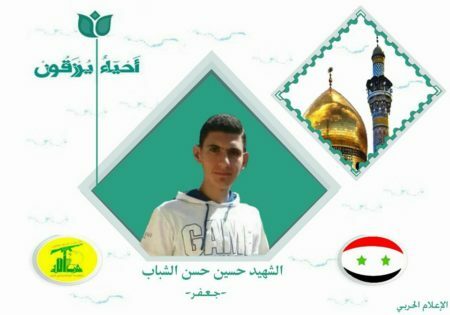 Even so, that Iran in particular has felt pressured on account of al-Fu'a and Kafariya's status became most evident in a deal reached with rebel factions including Ahrar al-Sham to impose a ceasefire status on the two villages in return for a ceasefire status for the towns of al-Zabadani and Madaya in the Damascus countryside that were besieged by the regime and allied militias including Hezbollah. As part of this deal, all four localities were to receive humanitarian aid. In the broadest terms, this deal has held, whatever might be said of manipulation/restrictions on the aid arriving and clashes from time to time. For instance, reports of the arrival of aid for al-Fu'a and Kafariya can be found in late November and early December. That aid has been allowed in has sometimes been a talking point invoked as a stick to beat the rebel factions. A case-in-point is Abu Ahmad al-Shari'i- a cleric affiliated with the Islamic State-linked Jaysh Khalid bin al-Waleed- who wrote on Twitter regarding the arrival of aid to the villages in late November: "After Assad seized the Hanano residences [part of east Aleppo], Ahrar and Fatah al-Sham respond by allowing 40 trucks to enter Kafariya and al-Fu'a: all this in order to please the people of the Cross." Yet this kind of polemics should not distract us from the hardships of life faced by the inhabitants of these villages, and that civilians including children have been killed and injured in shelling by rebel factions. It is sometimes pointed out that the problem is that the regime side more generally is more reluctant to talk to outside media than the rebels, and thus the plight of these villages has understandably been given less attention. There is some truth to this point, though there is also quite a lot of open source material on Facebook in particular for those who wish to look. 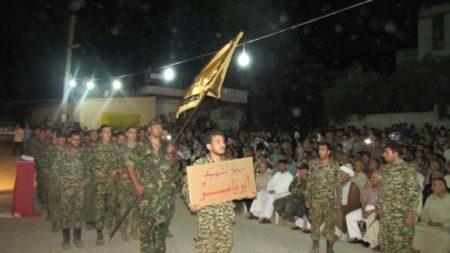 As for the military situation in the two villages, the forces fighting to defend al-Fu'a and Kafariya are frequently referred to as lujan sha'abiya ("Popular Committees"), a common term for local pro-regime militias. However, the villages' isolation has not prevented foreign militia involvement in the military efforts to defend the villages. Indeed, one source from al-Fu'a told me in October that most of the fighting force is affiliated with Hezbollah and the Iranian Revolutionary Guard Corps. In July 2015, the Hezbollah military commander Jamil Hussein Faqih (al-Hajj Abu Yasir) was announced to have been killed: he was described as the Hezbollah official responsible for the portfolio of al-Fu'a and Kafariya, and his grave is said to be in al-Fu'a. Undoubtedly in reference to him, a Saryat al-Shaheed Abu Yasir ("Martyr Abu Yasir Squadron") turns up in at least one photo of a festival and parade from the area, as seen below. Another brand name that turns up for al-Fu'a and Kafariya is Saryat al-'Ishq ("Squadron of Love")- as in, loving/longing for martyrdom ('Ishq al-Shahada). For example, the name turns up in the 'martyr' graphic for a fighter from al-Fu'a called Kadhim Muhammad al-Muhammad, declared to have been killed defending the two villages on 11 September 2016. The graphic can be viewed below. Note the Sayyida Zainab shrine of Damascus in the top-left corner, and Hezbollah leader Hassan Nasrallah's portrait in the top-right corner. The Saryat al-'Ishq name appears in the bottom left. 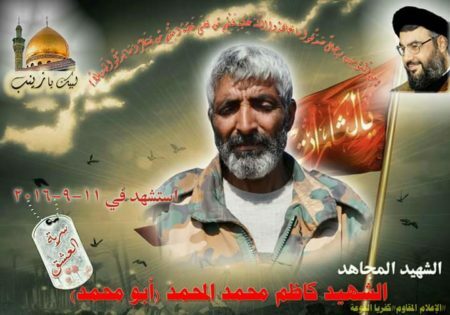 The banner next to the slain fighter's portrait reads: "Ya latharat" ("Oh avengers"), referring to those who avenge Imam Hussein. The Saryat al-'Ishq brand also turns up in other 'martyrdom' announcements from the two villages. For example, observe the post below for three 'martyrs' from July this year. "Martyrs of the fine age: Saryat al-'Ishq_al-Fu'a_Kafariya. The martyr Saleh Muhammad al-Hussein, the martyr Majdi Ahmad Mando, the martyr Yusuf Ibrahim Aslan." 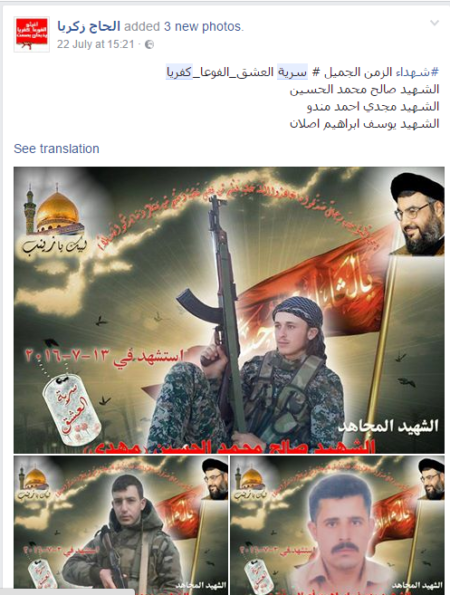 Other graphics for 'martyrs' from al-Fu'a and Kafariya do not give a specific name but do feature the Hezbollah flag. For example, see one below for a certain Hussein Hassan al-Shabab. Top left: "Living they are nurtured" (a reference to a Qur'an quotation that one should not reckon that those who have been killed fighting in God's cause are dead, but rather nurtured and living with their Lord). Top right: Sayyida Zainab shrine. By itself, the inclusion of the Hezbollah flag in a person's 'martyrdom' graphic does not automatically make that person a member of Hezbollah. However, the pervasiveness of the name and brand in al-Fu'a and Kafariya and more generally among the Syrian Shi'i communities- something that can also be observed for comparison in the Aleppo Shi'i villages of Nubl and Zahara', which has at least two identifiable formations affiliated with Hezbollah (Junud al-Mahdi and Fawj al-Imam al-Hujja)- only illustrates the way the Syrian Shi'i demographic has come to identify thoroughly with the group and by extension its Iranian patron and ideology. Besides the involvement of al-Hajj Abu Yasir in al-Fu'a and Kafariya, a concrete line of evidence for Hezbollah involvement in the villages can be found in the form of Kashafat al-Wilaya ("al-Wilaya Scouts"). 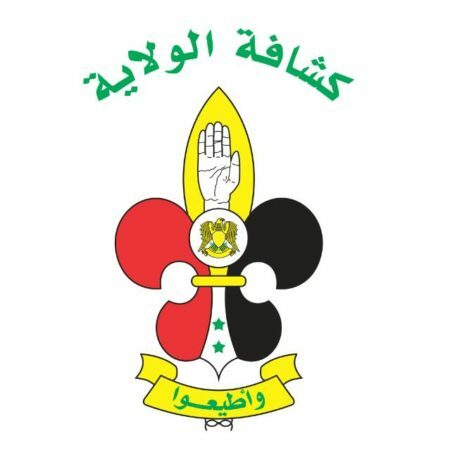 This scout association, like the Imam Mahdi Scouts (Kashafat al-Imam al-Mahdi), is affiliated with Hezbollah. The main difference is that Kashafat al-Wilaya appears to be specific to Syria. Even so, the Imam Mahdi Scouts has a branch in Nubl and Zahara' that was formally established in Ashura' of the year 2012 and goes by the name of the Imam Mahdi Scouts. So it is not immediately clear why both names and brands should be used, unless perhaps it is analogous to Hezbollah's creation of multiple militia fronts and brands to recruit more and more Syrians and build a native Syrian 'Islamic Resistance' (e.g. Quwat al-Ridha and Liwa al-Imam al-Mahdi). Emblem of Kashafat al-Wilaya. The emblem is given a distinct Syrian flavour through including the Syrian flag and a version of the emblem of the Syrian Arab Republic. On bottom: "And obey." This slogan is also used by the Imam Mahdi Scouts on its emblems. Kashafat al-Wilaya has multiple local branches. 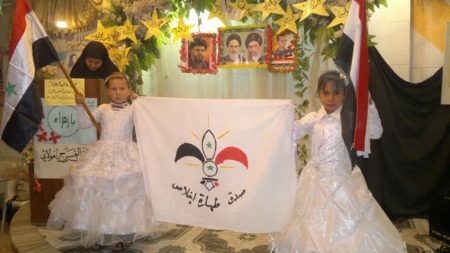 For example, the branch for girls in the al-Abbasiya area of Homs- where many Syrian Shi'a are located- is called Fawj al-Sayyida al-Zahara' ("Sayyida al-Zahara' Regiment"). The branch for the al-Fu'a area (and presumably by extension, Kafariya as well) is called Fawj Fatima al-Zahara' ("Fatima al-Zahara' Regiment"), named for the daughter of the Prophet Muhammad. Multiple photos on the ground attest to the existence and activities of Fawj Fatima al-Zahara'. Photo including placards of Fawj Fatima al-Zahara'. The top one includes portraits of Ayatollah Khomeini, Ayatollah Khamane'i, Bashar al-Assad and Hassan Nasrallah. 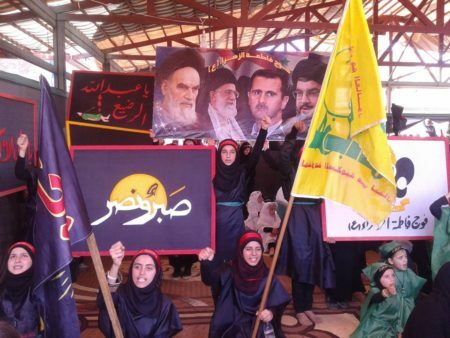 Also note the Hezbollah flag in the photo. This was part of Ashura' 2016 commemorations. "Patience and Victory" (central placard) was the main slogan for Ashura' commemorations in the area this year. 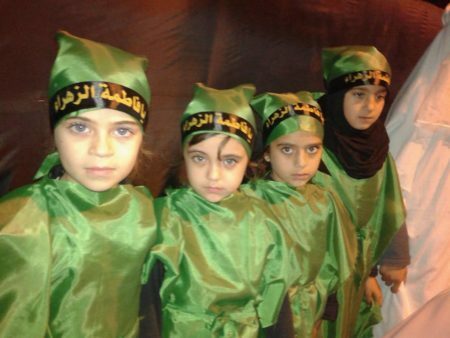 Young girls with Fatima al-Zahara' headbands. Commemorating the birth of Fatima al-Zahara'. The banner reads: "Honesty, Purity, Sincerity." Overall, it is entirely unsurprising that this kind of polarisation has happened. Regardless of the initial rights and wrongs surrounding the entire rebellion, considering the siege status and being surrounded by rebels led principally by Jaysh al-Fatah, which includes Jabhat Fatah al-Sham that forced the Druze of Idlib to convert to Sunni Islam and would probably have done the same to the Shi'a if al-Fu'a and Kafariya had been taken over, it is clear many if not most in the villages see Hezbollah and Iran as their main protectors intervening from outside. The notion of being the protectors of Shi'a has allowed Iran and Hezbollah to expand their influence strongly among Syrian Shi'a. Rather than Syria becoming the next Islamic Republic, it is apparent the Syrian Shi'a, who constitute only 1-2% of Syria's population, are most amenable to ideological influence from Iran and Hezbollah. This fits a wider pattern in the region where Iran in particular most successfully builds patron-client relations with fellow Twelver Shi'a in particular. In any case, none of this should be used to minimize the humanitarian impact of the sieges on al-Fu'a and Kafariya. At the same time, one should not forget that the regime sieges of rebel-controlled communities are more numerous and have often been more severe in impact. None of these cases merits being exploited for the purpose of partisan political debate on the Internet.